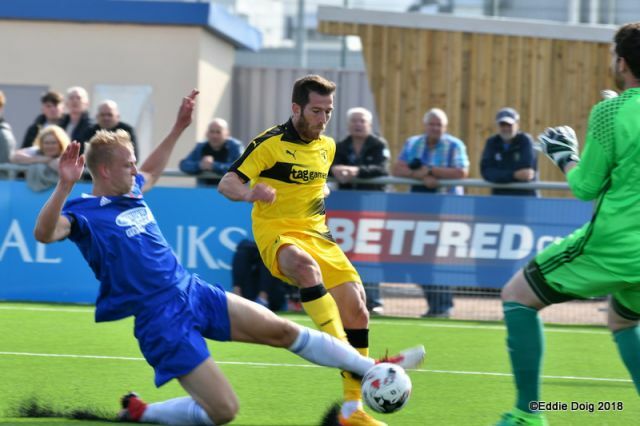 A deserved win for Cove Rangers brought Raith Rovers’ BetFred Cup campaign to an end, following a disappointing ninety minutes against the Highland League champions. 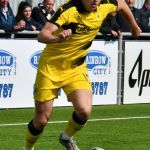 Goals from Park and Masson, coupled with strong running from strikers Megginson and McManus, gave the home side the three points. A poor afternoon from a Raith perspective included a missed penalty and an injury to keeper Robbie Thomson. 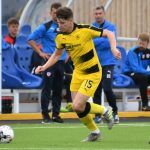 With creditable performances against Hearts and Inverness following a poor opening showing against Cowdenbeath, Raith looked to build a strong foundation for the commencement of League business the following week. This was Rovers’ first trip to Cove’s smart new Balmoral Stadium on Aberdeen’s southern outskirts. 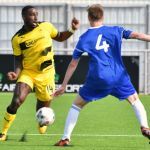 Backed by a boisterous home support, it was the home side who looked lively through-out, pacy in attack, and relatively strong across the back four. Raith, with Ian Davidson on the bench, began with Benedictus and McKay at centre-half, Wedderburn in front, and Duggan upfront on his own. Under heavy skies but the worst of the morning’s rain having cleared, Cove began in an orthodox 4-4-2, with ex-Rovers Megginson and McManus furthest forward, but with a narrow midfield. 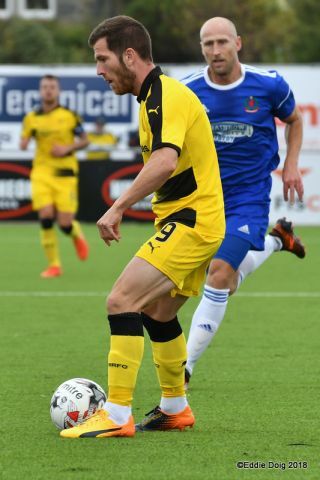 Kevin Nisbet on Raith’s right found early space to drive on against his opposite number. 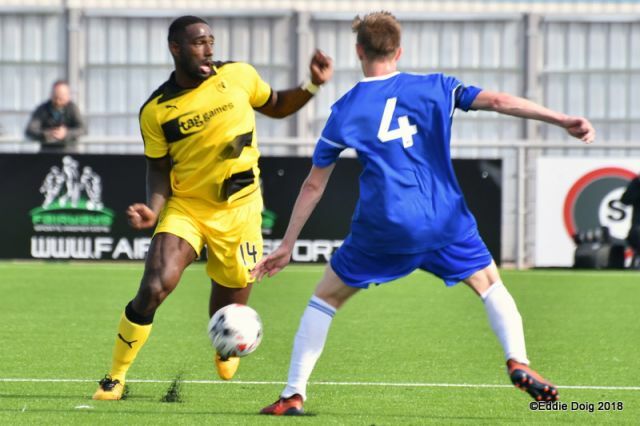 The first clear chance fell to the hosts – Megginson beating his man and crossing, Wedderburn was unable to clear, allowing Park to shoot, his effort deflected wide. 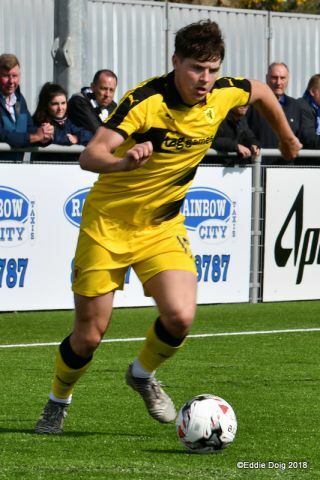 McManus’ header was cleared off the line by a combination of Thomson and Watson, with Cove players claiming the ball had crossed the line – referee Kevin Graham (without V.A.R. to assist him) dismissed the appeals. 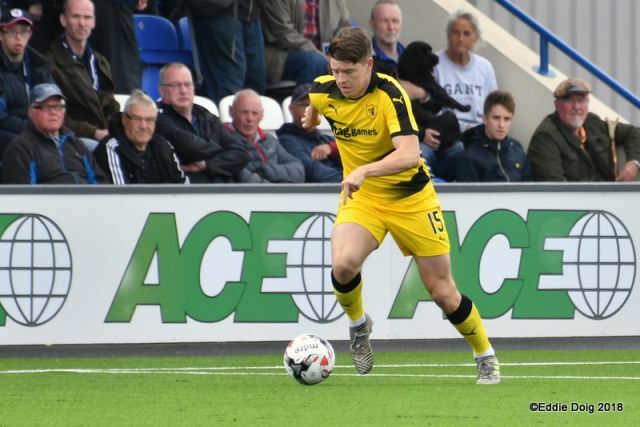 Raith’s 4-1-4-1 formation struggled to impose itself in the opening exchanges – both Megginson and McManus were able to come short, allowing midfielders Scully and Masson to press on. With both Raith full-backs looking to advance, Cove’s twin strikers pulled their markers wide into space. 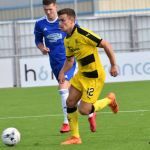 Matthews and Milne in Raith’s midfield saw numbers attacking both left and right, with John Sheran’s side picking the spaces well and showing a maturity in possession. 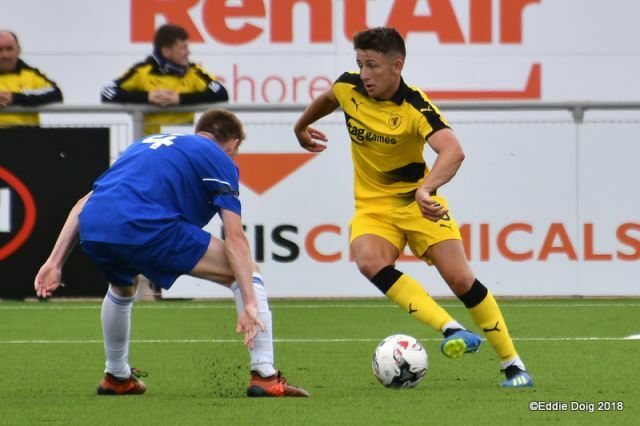 With nine minutes gone, the opening goal – Megginson looped a lovely first touch over Benedictus, shooting off the post to Thomson’s left. Daniel Park was on hand to knock home the rebound into the unguarded net. With the clouds beginning to clear, it was the home side feeling the sunshine on their backs. Masson blasted high over from twenty-five yards. 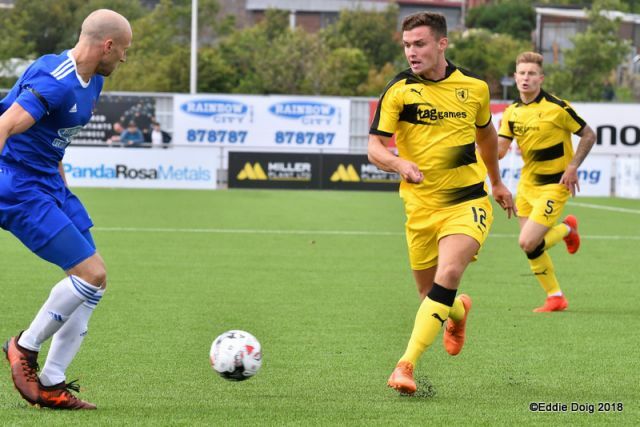 Another blow for Raith on eleven minutes – Chris Duggan, chasing a through ball, pulled up suddenly, clutching his left hamstring. Signalling immediately for a change, the striker made his way gingerly up the touchline, to be replaced by Liam Buchanan. An untidy challenge from Matthews on Milne spoke to Raith’s frustration in the first quarter of an hour. 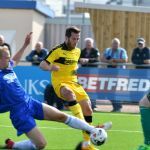 Rovers’ keeper Thomson was called into action again on twenty minutes – Redford made good ground from right full-back, chipping inside for Yule to shoot straight at the Raith keeper. A quick free-kick from Scully released Masson, who blasted into Thomson’s side netting from a tight angle. With the hosts passing neatly, the travelling support were becoming agitated. Meggison and Megginson dropped deep, allowing midfielders to exchange passes and fill the gaps left between Rovers’ defence and midfield. 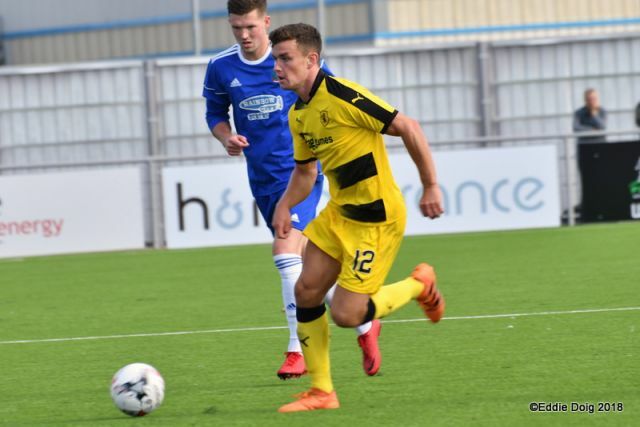 Raith’s first chance in fifteen minutes was fashioned with Milne slipping in Buchanan on an angle – retreating centre-half Kelly recovered well at full stretch. Wedderburn, winning a tackle in midfield, looked ponderous advancing on goal, with Park nicking the ball off the Raith man’s toe. On the half-hour, Buchanan produced a sharp save from McKenzie after Milne’s chip. Moments later, Matthews was unlucky not to pick out Stevenson when Raith had numbers forward. With Milne pushed up alongside Buchanan, for the first time in the match Raith looked like generating some attacking momentum. 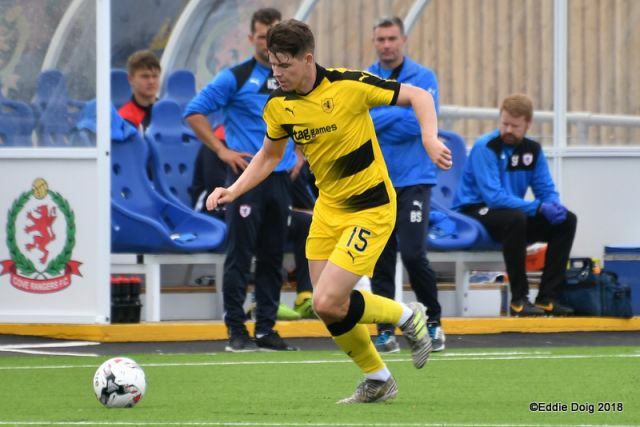 Released by Nisbet, Buchanan’s cross narrowly missed both Stevenson and Matthews flying in at the far-post – Raith’s reversion to a 4-4-2 was having a positive impact. Rovers’ first corner came from Murray’s flying run and cross, blocked away by Kelly. Although Milne’s delivery came to nothing, the away fans at last had something to cheer. With forty minutes on the watch, Milne thumped just wide from twenty yards, with keeper McKenzie scrambling across his goal. McKay should have done better, picked out by Murray from another Raith corner. Liam Buchanan again scampered wide, his driven cross fired goalwards by Matthews, Ross completing a hasty clearance. On the stroke of half-time, a let-off for Raith. Under Masson’s corner, Matthews and Milne jostled, arms everywhere. With both players hitting the turf, referee Graham looked long and hard, eventually dismissing the loud penalty appeals. 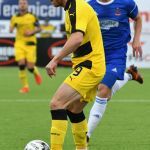 With the benefit of the slow-motion replays football fans have become familiar with, the decision may have gone the other way. 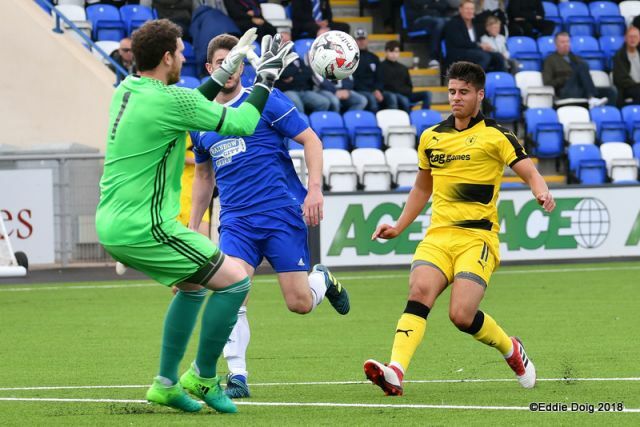 With Valentine on for Stevenson to start the second-half, Raith’s attacking intent was undone almost immediately with a great chance for a Cove second. 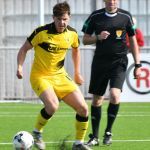 With Thomson failing to control a back-pass, Park’s corner found Masson unmarked at the near-post – the home midfielder’s header falling just outside Thomson’s upright. Scott Ross’ glancing flick nearly curled into the Rover’s net seconds later. Megginson’s deflected effort bounced just wide. Nisbet’s chip drifted over the home cross-bar with Raith’s first effort of the second period. With the pitch now bathed in sunshine, a lovely pass saw Masson streak beyond Matthew – Thomson made a diving save low to his right, aggravating an injury in the process. Following a stoppage, the Raith keeper seemed in genuine discomfort – looking disbelieving as the match roared on at the other end. Sure enough, Cove broke forward – Megginson bursting through midfield, rounding Benedictus, and forcing an excellent – and no doubt painful – save from the stricken Raith keeper. No doubt later than he would have wanted, Thomson hobbled off, young replacement Sam McGuff taking his place. With an hour gone, Raith began to press – Nisbet’s blast from a corner was blocked; Murray escaped to the right touch-line, crossing dangerously; and Milne’s strike again failed to clear the forest of legs in the home box. 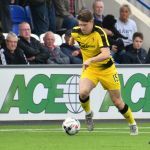 With the breeze blowing in Raith’s favour, both Buchanan and Milne looked to chase beyond the home defence – equally, with the ball holding up, Megginson and McManus both appeared full of running and keen to chase lost causes deep into Raith territory. Scully’s rising drive was the only chance of note as the game entered a fallow, scrappy period. 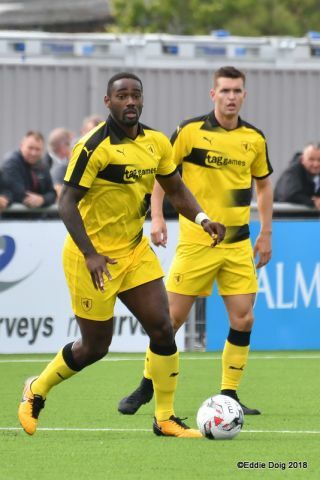 Benedictus headed tamely wide as the match entered its final quarter of an hour. 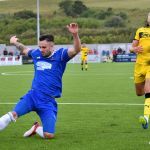 The second for Cove put the game out of Rovers’ reach – Masson jousted with young keeper McGuff over a bouncing ball, with the Cove midfielder winning the battle, prodding home into the empty net. 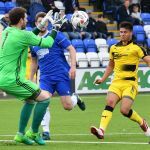 The seventeen-year-old keeper looked crestfallen – but needed to look lively seconds later, ushering McManus’ rasping drive into the side-netting as Cove looked to steal a third. With substitute MacRae looking lively upfront, Rovers’ defence looked vulnerable as Cove attacked with pace from deep areas. With manager John Sheran roaring from the touchline, there seemed no question of the home side tiring as the match entered its last ten minutes. McManus’ regular battles with Benedictus were one of this game’s defining features. 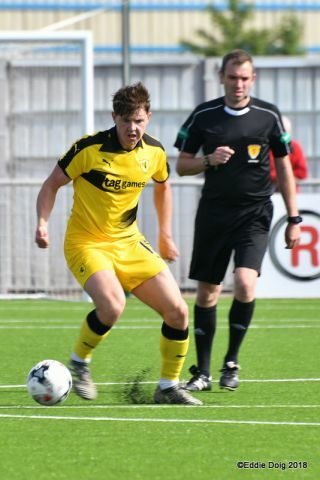 The stocky Cove frontman showed resolve in the challenge and strength in the air – with Benedictus giving no ground and bellowing at his defenders to cover, McManus was frequently able to hold the ball up, invite runners into spaces, and chase into gaps looking for another through ball. 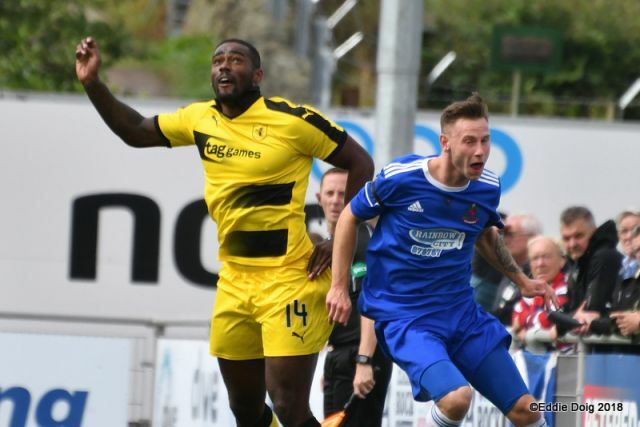 The Cove striker was inches away from connecting with MacRae’s cross with five minutes left. To sum up an afternoon where nothing had gone right from a Raith perspective, Buchanan was felled by Milne on eighty-eight minutes. Referee Graham didn’t hesitate in pointing to the spot. 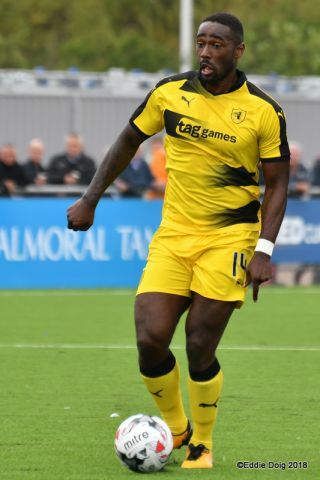 However, Buchanan’s penalty was placed rather than driven, clipping the outside of McKenzie’s post – Buchanan held his head, the cheers of the home fans ringing in his ears. With the final whistle following minutes later, Raith’s players made their way disconsolately down the tunnel. 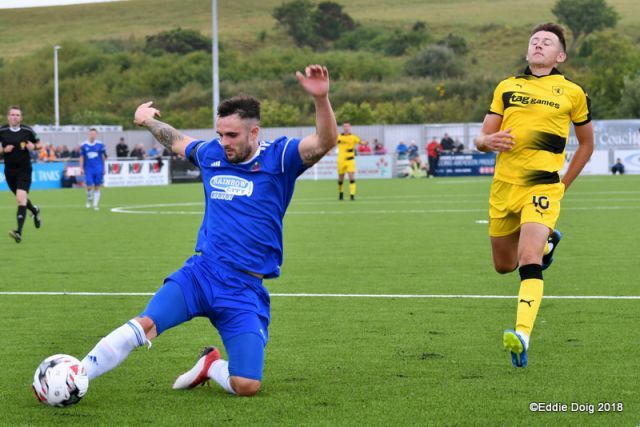 With Cove’s players cheered off the park, manager Barry Smith has a job to do to lift a depleted squad for the opening match of the League campaign, away to Stranraer next weekend. Welcome to the Balmoral Stadium at Cove. There is a hugh contrast in weather from the midweek game, it's 17 degrees and drizzling with rain. Milne chips the ball into the box. Buchanan picks it up and tries for a shot. Keeper gets down to save. Cove worked hard as Raith are forced into making 3 subs and miss a penalty. 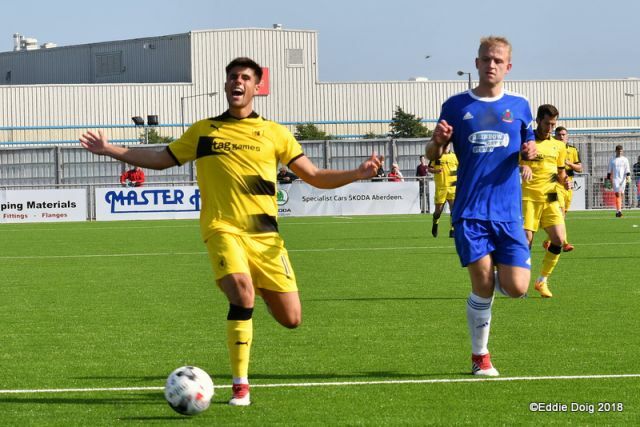 League campaign starts next week away to Stranraer. McKenzie, Redford, Milne, Yule, Ross, Kelly, Park, Masson, Megginson, McManus, Scully. Subs, MacRae, Gray, Emmett,Milne, MacLeod, McCafferty (GK). Thomson, Watson, Murray, Benedictus, Duggan, Milne, Matthews, Wedderburn, Nisbet, Stevenson, McKay. Subs, McGuff, Davidson, Buchanan, Valentine, Berry. 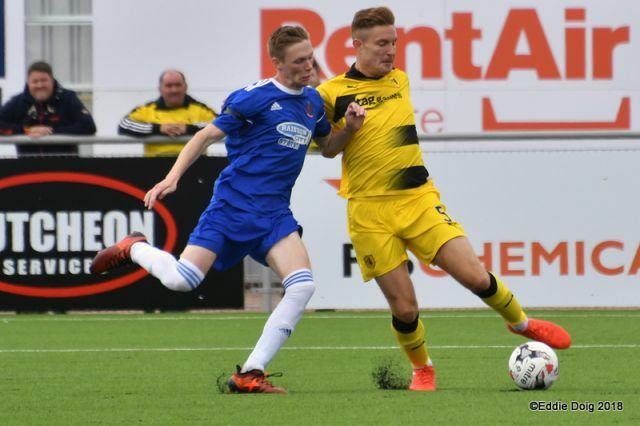 Raith Rovers will make their first ever trip to the Balmoral Stadium this weekend, the brand new home of Cove Rangers, in the final Group C fixture of the Betfred League Cup. There’s only pride to play for, with neither side able to make the last sixteen, although avoiding defeat would ensure Rovers finish above Cove in the final standings. A win for Cove would see Raith finish bottom of Group C.
Rovers go into the game on the back of a 2-1 loss at Inverness. 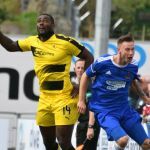 Nathan Austin gave Inverness the lead early in the second period, before Grant Gillespie equalised with a fine strike from a Lewis Milne corner. 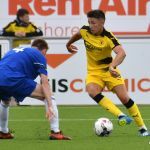 However, a late Daniel McKay strike kept Inverness three points clear of second placed Hearts, meaning they’ll go into the final match against the Gorgie club needing a draw to top the group. 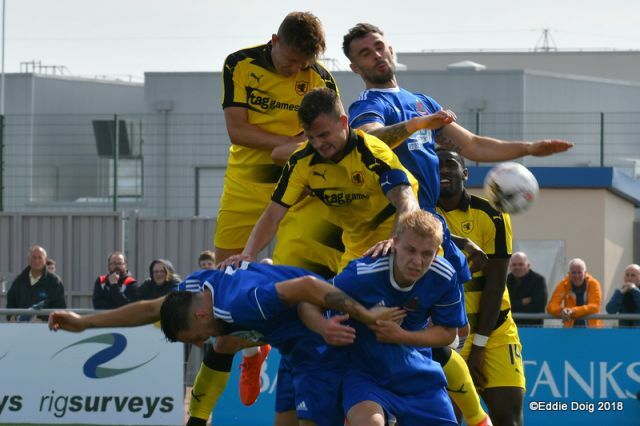 John Sheran’s Cove Rangers team have held their own in every fixture so far, running Inverness close before losing 2-0, while the Hearts and Cowdenbeath fixtures were even tighter, losing 2-1 to Craig Levein’s men and 1-0 to Cowdenbeath. 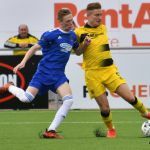 The two club’s only previous meeting came in the group stages of this competition two years ago, with a meeting at Station Park, Forfar. 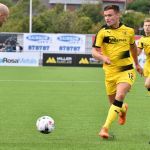 Ryan Stott gave the Highland League side a surprise lead over Gary Locke’s men in the 32nd minute, but it was short-lived, with Kyle Benedictus equalising within five minutes, before Lewis Vaughan completed the scoring ten minutes into the second period.